2Curlyheaded Monsters: Exciting News! Grand Opening at Go Digital Scrapbooking and 50% OFF SALE!!! Yaaahoo! Exciting News! 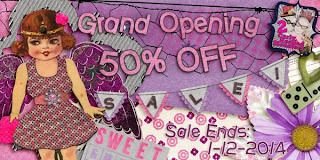 Grand Opening at Go Digital Scrapbooking and 50% OFF SALE!!! Yaaahoo! I am SOOOO Excited!!! Today, January 5, 2014 my brand new store opens at GoDigitalScrapbooking!!! GDS is the very first place that I ever purchased a kit or submitted a layout when I first hit the digi world so to me it is like coming home!!! To celebrate my Grand Opening I have a special sale going on from Jan 5 thru Jan 12th!! Check out my new store HERE!